Speaker of the Northern Ireland Assembly, Robin Newton MLA has launched the tour of art exhibition, ‘Stormont: A Sense of Place’, in the EastSide Visitor Centre, East Belfast. Speaking at the launch, Speaker Newton MLA said: “I am delighted to officially open this fantastic art exhibition, particularly as the first venue on its tour of Northern Ireland is within my own constituency and in a brand new tourist attraction, designed to showcase the many famous faces and places of East Belfast. “I recently announced my intention as Speaker to focus on ‘Creating Opportunities’ and believe that Parliament Buildings should act as a platform to inspire and encourage the potential within our society by seeking to create opportunities for others. The art exhibition greatly reflects this theme by creating the opportunity for the work of the students of the Belfast School of Art to be seen both in Parliament Buildings and now by many more people across Northern Ireland. The artwork by students from the Belfast School of Art, Ulster University, was commissioned by former Speaker Mitchel McLaughlin and was on display in the Great Hall from March – September 2016. 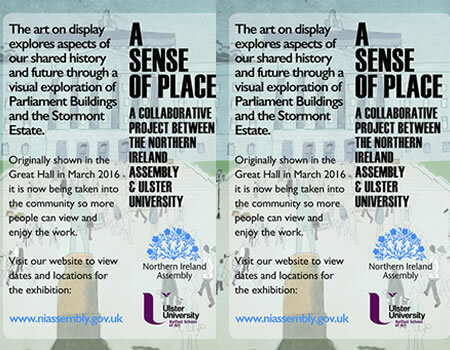 Artists were asked to create an illustration in response to an aspect of a shared history and future through a visual exploration of Parliament Buildings and Stormont Estate.